Do you all remember my “Snow Bird” from last year? Well my Anna’s Hummingbird is still hanging around but this time with his wife and brood of 2 chicks from this year. As the temps have been falling I need to really keep on top of making sure his feeder is not freezing solid and he has adequate shelter close to the feeder. This little fella sits on a vinyl coated wire all day about 2 feet from the feeder or on the Japanese Maple a few feet from my front door. He never ventures far from the house which I’m sure radiates a bit of heat and cuts the wind. 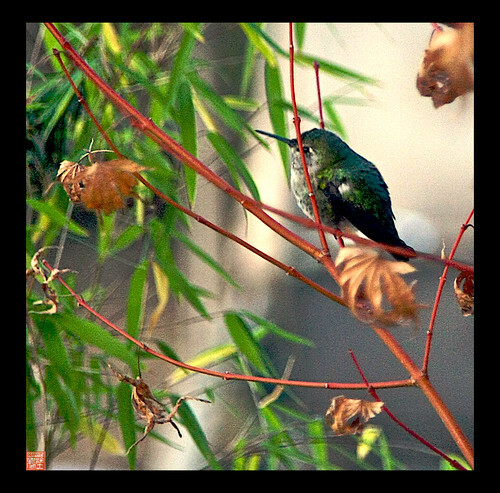 Hummingbirds have a unique way of keeping warm or conserving their energy – at night, or any time they cannot get enough food to fuel themselves – they go into torpor – a state in which their metabolic rate is only one-fifteenth that of normal sleep….very much like hibernation. I can walk right up to him in the early morning without him moving a muscle. I call these beautiful Anna’s humming birds my “tree pickles” or “gerkins” because they are shaped and colored just like one! Last night I forgot to bring the feeder in….The red popsicle needed thawing. When I brought it back out, 2 hummies buzzed me and landed on the feeder while I was still hanging it up. I hope I can get Steve to get a photo of them doing that tomorrow!!! I told my friend today I want to get them each a little match box complete with blankie and hot water bottle for Xmas to sleep in!! So what does one do on a cold week to keep warm???? Created fused glass and finish up some batiks!! CLICK PHOTO TO READ MORE ABOUT THIS “ADOPTED” HANDBAG! More items will be posted on the GRAFFITI JEWELRY website this week. My sister and I used to laugh about my Mom calling a garment Gerkin so I clicked to see what awesome garment you had created this time. Wow, I was blessed with the wonderful hummingbird story and vivid photos, just beautiful. do what a way to start a day!! I am listening to LIVE 88.3 , contemporary Christian music so it is a doulbe blessing to hear and see how great is our GOd. Have a most blessed day you beautiful soul! I forgot, I wanted to say,, we do not laugh at these quaint saying of our Mom anymore. ALSO GUESS WHAT THIER CALL LETTERS ARE WDLF !!!! WHAT a co incidence. I take my hummingbird feeders down about July or August. I want the litle guys out there spreading around the pollen as they are supposed to do. (There are lots of flowers here then…”here” is Sedona, Arizona.) I also want the hummers to migrate and not be dependent on the feeders. THEN I put the feeders back up again in December or January…depending on the weather. There aren’t so many flowers or insects here then, and there is always a stubborn bunch of “gerkins” who remain here in the winter. I want them to be able to have food and shelter. They quickly find the feeders, and in no time at all, we witness the territorial battles and skirmishes hummingbirds are so good at. I’m glad to find someone else who remembers these fiesty little friends in hard times. Hi Jan and Connie!! Yep, I do the exact same thing to encourage the ruby throats etc. to migrate..unfortunately Annas hummingbirds just dont’ get the hint ..lol! 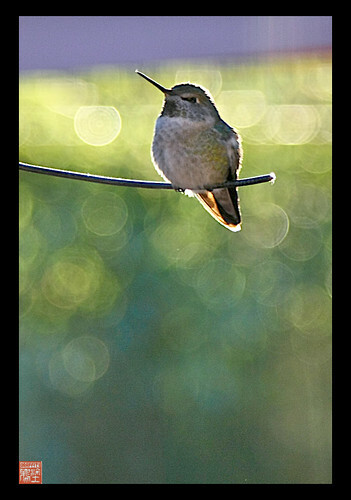 “Anna’s Hummingbirds in coastal California, Oregon, Washington, and Vancouver Island do not migrate at all, and a year-round feeder usually means year-round birds. Farther inland, Anna’s may move seasonally to make best use of local resources; these movements may be more attuned to elevation than to latitude”. I adore the little stinkers. Today one landed on my head while I was putting his feeder back out . He was H-U-N-G-R-Y!!!!! That “adopted” handbag was just gorgeous! Can see why it didn’t last long. 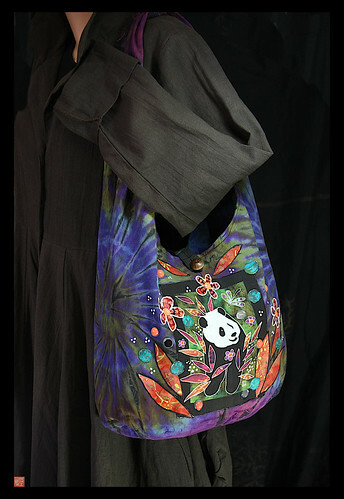 SOOOOOOO Happy to get the panda handbag! It is even more gorgeous than the photos! Once again, your talent just stuns and amazes me! A treasure forever, and thanks so much for the extra goodies and packaging like a present!!!!!! CONNIE …I’m soooooooooo excited you love your new bag!!! I miss that bag!! It was hanging on my mannequin after I got it done and I loved the way the mirrors would glint when the sun came in and hit them.